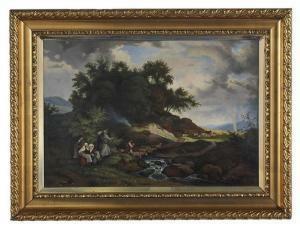 Find artworks, auction results, sale prices and pictures of Ludwig Adrian Richter at auctions worldwide. 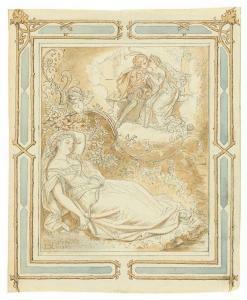 Lot 3454 - A186 Old Master Drawings - Friday, 28. September 2018, 11.30 AM RICHTER, LUDWIG (1803 Dresden 1884) Three drawings: 1. Grandfather under an apple tree with children and grandchildren. 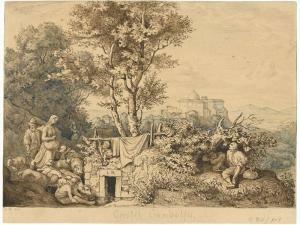 Verso: The goose market; 2. 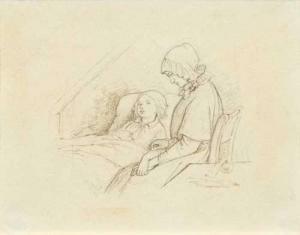 Mother at the bedside of a sick child; 3. Oberfischmeister und Amtmann beim Wein. Pencil drawings, one sheet with grey pen, a further drawing with brown watercolour. 10 x 10 cm (image), 8 x 10 cm (image) und 7 x 8 cm (image). Each framed. Nr.3 served as model for a wood engraving. Description: Signed and dated lower left: L. Richter 1836 Signed and dated lower left: L. Richter 1836 This watercolour and two variations formed studies for a painting made in 1836, the whereabouts of which are now unknown, which was commissioned by the Dresden engraver Ludwig Gruner (cf. M. Bernhard: Deutsche Romantik, Berlin 1975, p. 1380 and exhib. cat. : "Ludwig Richter und sein Kreis", Dresden 1984, no. 235). All three watercolours are based on a plein air study from Richter's Roman period showing the Torre del Quinto in the Campagna. Proceeds from the sale of this work will go to benefit the Cardinal Meisner Foundation, Cologne. 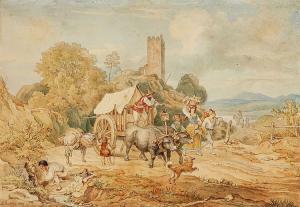 Dimensions: 16 x 23 cm Artist or Maker: Ludwig Richter Medium: Watercolour on paper Provenance: Lempertz 12.12.1991, lot 459. - Cardinal Dr. Joachim Meisner, to benefit the Kardinal-Meisner-Stiftung. Description: After Adrian Ludwig Richter (German, 1803-1884) "Bohemian Pastoral Landscape", 1911 (after the 1841 original) oil on canvas signed and dated lower right, "Konigl Gemaldegalerie, Dresden, 1911" stamp en verso. Framed. 28" x 40-1/2" Provenance: Konigl Gemaldegalerie, Dresden, Germany, 1911; Private collection, Edmonton (Alberta) Canada, 1943; Private collection, Baton Rouge, Louisiana.